Here is your opportunity to work one on one with me. In celebration of my Mastery Announcement. I’m offering a 20 min laser session at a SUPER low rate! All session specials held via phone or skype. * Time may be used in 20, 30 or 60 minute increments. You will have 6 months from date of purchase to use your time. your name will go into a drawing to win a 60 minute session with me! Each package includes 1 or more entries! will have a chance towin a complimentary 30 minute session. I will draw the winner(s) onFebruary 18, 2012.
session to transform their life! 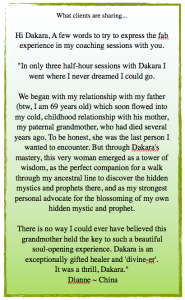 Ready to book Dakara as a Speaker for your event?